If there’s one thing I’ve learned during the past several years it’s not to judge the process. When we launch into something we often have a pre-c0nceived notion of how things are supposed to unfold. It’s simple, right? Have a dream; set a goal; plan a destination and that should be enough to get us on our way. Well, it is, and it isn’t. John Lennon famously said that “life is what happens when you are busy making other plans.” Often what we don’t understand is that life, no matter how topsy turvy and mettle testing it is at the time, is unfolding as part of the plan to reach our dream. It’s why it’s so important to acknowledge the journey and be immersed in it wherever it takes us. We may reach, or even exceed, our dreams if we just hold on tight and don’t let go. Eight years ago, after reading “Riding Between the Worlds” by Linda Kohanov, I had a dream to acquire the training I needed to help people heal through the way of the horse. I was already a nationally certified equestrian coach so this would be a natural extension of what I was already doing. In my innocence (or ignorance) I thought achieving the dream would be a simple case of signing up for Linda’s course in Arizona and, once completed, setting up my shingle somewhere here in southern Ontario. Nothing could have been further from the truth … because I was disconnected from my truth. At the time I was in my early 40s and struggling with life on so many levels, looking for escape. My focus was on running away rather than walking steadfastly toward something. Down ~ Within months of formulating this dream I was restructured from my job as an advertising copywriter and went into a depression. Down ~ Six months later the horse I’d been part-boarding for two years died of cancer. Up ~ Four months later, after a relatively easy search, by all accounts, Bear cantered into my life. 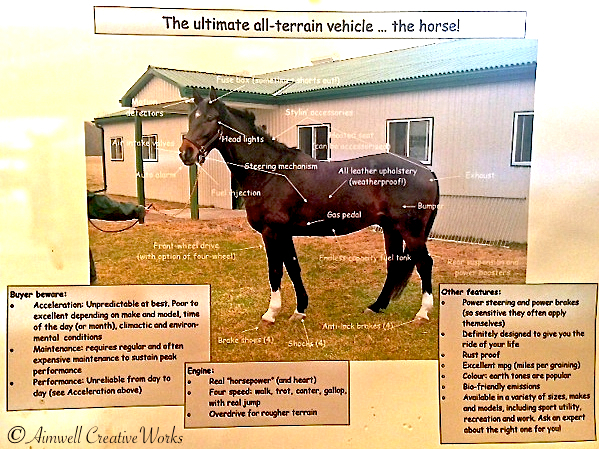 Up ~ One month later training began with Chris Irwin ~ my introduction to healing with horses through his Train the Trainer program and Equine-Assisted Personal Development. This was when I started to realize how broken I was and led to eighteen months of art therapy. Down ~ A trip to beautiful, battle-scarred Sarajevo in 2009 sent me into five years (and counting) of psychotherapy ~ my own life battle scars screaming for attention. Up and down and up ~ The death of old friendships and the birth of new ones tested my emotional resiliency in ways I had not expected. Yes, life happened; demanded I pay attention; tested my resolve, strength and commitment to the ups and down; the highs and lows of the healing process. Could I weather the storms I was intending to help others with through healing with horses? It was an honest enough question. How could I facilitate in others what I had not experienced for myself? These experiences have, indeed, brought me full circle to the point at which I am happy to announce that I have registered in a six-month Facilitated Equine Experiential Learning (FEEL) certification program which begins at the end of June. 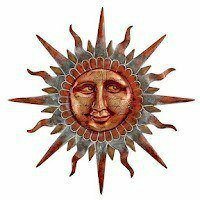 It’s a program based on the teachings of Linda Kohanov and, as luck would have it, the sessions take place just a half hour away from home. It’s a big decision made after much considered thought and meditation. However, I feel that it is the right move for me as I continue along my own healing journey. I am confident this course will teach me much about how I relate to the world and will help to heal aspects of my inner world still requiring attention. And, of course, it will take me another purposeful step closer to realizing my dream of helping people heal through the way of the horse. I’m ready for this new step but am not kidding myself ~ it will be another intense period of growth bringing with it the inevitable roller coaster of emotion. What’s another roller coaster on the circle of life when it takes us closer to our dreams? I firmly believe our heartfelt dreams never die. When a dream is meant to be it seems that life provides the experiences we need to create the environment the dream needs to come true. It’s why we must never judge the process or how long it takes … or quit. Hold fast to your dream. It may be closer than you think. I’ll be taking a break from blogging for a couple of weeks. When I return my plan is to post regular updates as I proceed through the FEEL certification program and, of course, share the cheeky shenanigans of my beautiful Bear. Always remember to nurture what you love … and that includes you. As a writer I know I share at least one thing in common with anyone who puts pen to paper or finger tips to keyboard ~ we want to move people in some way. Move them to think; to act; to change; to believe; to hope; to aspire; to learn; to grow. Perhaps there are some with other more nefarious objectives but my goal, particularly with this blog, has always been to inspire, and perhaps teach, through the way of the horse … okay, my horse. The lessons I’ve learned in the past eight years with this incredible equine companion have altered me in so many amazing ways I cannot even begin to number them. Bear is among the kindest of souls and endears, with his gentle and comic personality, all who meet him. Perhaps the most important lesson he has taught me (so far) is the importance of self-awareness; to be in the moment. To wrap myself in the now and be fully present in every experience, even the ones I don’t enjoy so much. As one who has lived most of my life in a disassociated state this has been, as you might imagine, a most valuable and, at times, uncomfortable, lesson. A lesson I have explored both on the ground and in the saddle and thoroughly reviewed and attempted to integrate every week, for the past five years, in the therapist’s chair. Reclaiming Self is a serious business. When I go to the barn and look in Bear’s big baby browns, and he curls his lip in greeting and nickers for his carrots, I feel invited into, and an important part of, his world. Being disassociated means not feeling safe, never mind special, in anyone’s world, not even your own. The only way to survive is to create distance; to be there, but not be there. To trust no one, often not even yourself. The flight/fright hormone is engaged all the time. Horses will not tolerate this dysfunction in anyone since it triggers their own primal instincts to flee, i.e disassociate. It’s why horses are wonderful mirrors during the healing process. It is possible to know almost immediately how well you are doing by the response of the horse sharing your space ~ that is as long as you are aware of the impact you’re having on them in that moment. I’ve been around horses most of my life but Bear is the one who has shown me who I am and helped me recover my life. He’s been the equine therapist and a valuable teacher to this soul long lost, and I am blessed. My introduction to equine-assisted therapy came in 2006 at an Equine-Assisted Personal Development workshop with noted Canadian horse trainer, Chris Irwin. During the four-day closed session 10 of us participated in a variety of exercises designed to promote self-awareness ~ the horses engaged as remarkable catalysts for personal growth and learning. All exercises took place on the ground and within the safety of the round pen. To interact with the horse in this new way changed my life. It was the true beginning of my journey to healing and it made my interactions with Bear, who was new to me at the time, all the more meaningful. Both Chris and Linda have been developing global networks of qualified equine-assisted personal development/therapy practitioners. Naturally, I cannot recommend one over another, but if you are interested in exploring equine-assisted therapy as a healing option or you have a background with horses or in psychotherapy and would like to familiarize yourself with this work I recommend a visit to their websites to get started. Certainly there are other practitioners in the emerging field of therapeutic healing with horses. Many programs are adapted to provide specialized leadership training, while others are tailored to help troubled youth and prison inmates, and still others are designed to address issues of abuse. For many years special “riding for the disabled programs” have been integral to helping the physically-challenged gain a sense and awareness of their own bodies in a way that conventional physical therapy cannot. 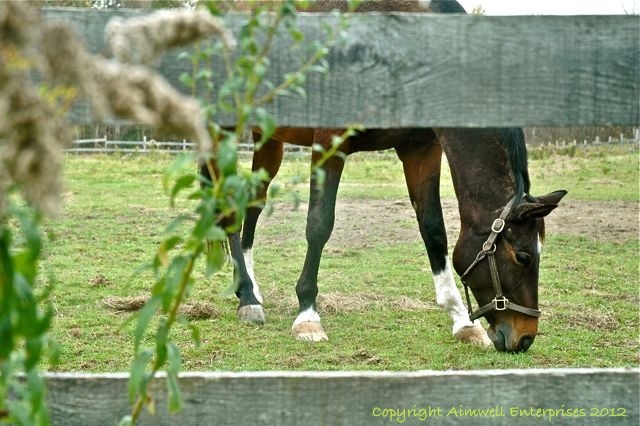 Over the years horses have evolved from farm and war machines to recreational and healing partners. All the better for them ~ and us ~ as long as we proceed with awareness and don’t abuse this privilege. I’m presently contemplating taking my journey of awareness to the next level by working with a qualified equine therapy practitioner in my area to address some lingering post-traumatic stress issues. This came at the recommendation of my new GP who practices Integrative Medicine. I just about fell out of my chair when she suggested, during our first meeting last fall, that I explore this healing option. Life is an ongoing journey and for years I believed my survival depended on me going it alone. 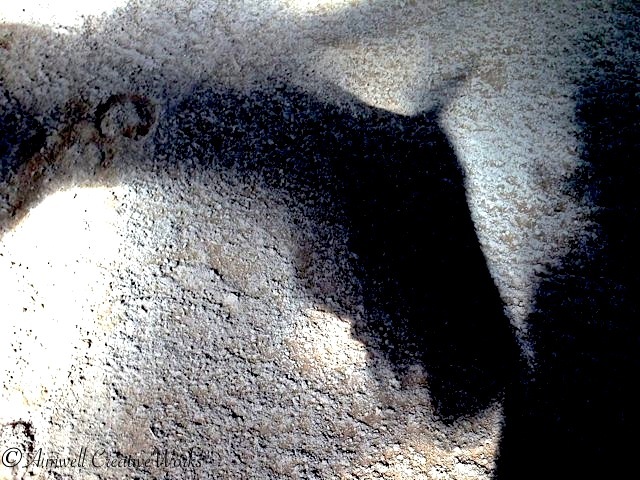 The horse ~ my horse ~ and the amazing people drawn into my life because of him, have taught me to believe otherwise. If you’re interested in learning more about the magic of healing with horses, check out the links below and other resources on the internet. My thanks to Ivy of Ivy_Mosquito|Love is free for nominating “Musings of a Horse Mom” for the One Lovely Blog Award. Ivy is a more recent follower of my horse mom musings and I’m touched that she has been so quick to pin a ribbon to my wall. Thank you, Ivy. 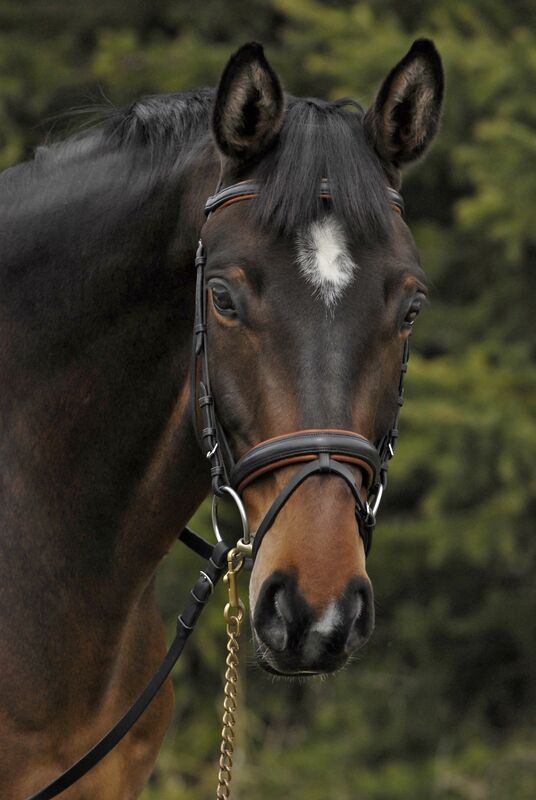 Bear’s bridle and dressage saddle are both Canadian-made by master craftsman Martin York of York Saddlery and Harness. I can highly recommend his incredible work. I’m OCD about Bear’s polo bandages and my shirt matching or at least complimenting each other. Coordination is king! 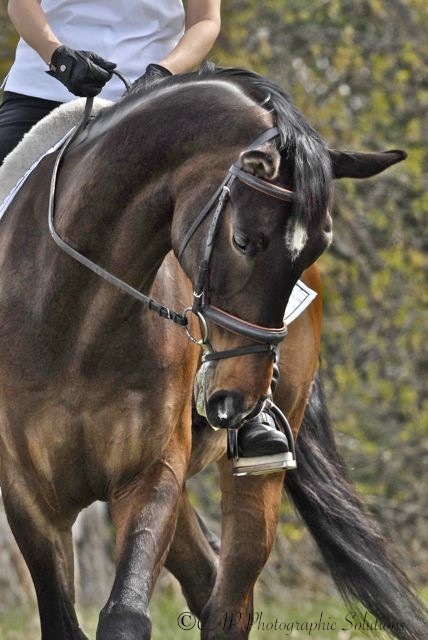 Bear’s bit is a Herm Sprenger KK Ultra Loose Ring Snaffle. I’ve used nothing else and he loves chewing on it. I always wear a helmet when I ride. My preferred brand is Charles Owen. 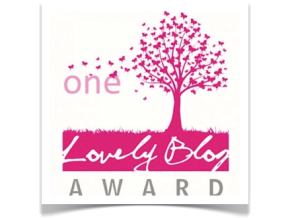 Here are seven lovely blogs I nominate for the One Lovely Blog award. Thank you to all who follow and “like” this blog. It means a lot to me that I can touch souls through my musings about life with my horse and beyond. Nurture what you love and enjoy the ride! Just over three months ago Bear and I made a major change in our lives by moving to another barn. The shift in awareness for us both has been dramatic. It’s almost as if we are awakening, finally getting to see our truth in the light of day. In fact, I even joked the other day that Bear is coming out of hibernation! And I feel like Sleeping Beauty kissed awake into a new realm of magical possibility. All the romance aside, waking up is hard to do. Life can be so overwhelming for many of us that we learn to numb ourselves to the day-to-day adopting, however unwittingly, a disassociated state just to get by. As a result we don’t feel present in our experiences and our lives, and when we look back all we see is a blur. I know this to be true, for it is my experience. To be awakened, no matter how gently, has the potential to wreak inner havoc. However, if we are to be free of the over-shadowed life we must wake up and step into the light, even though it’s bound to be a bit disorienting for a while. The real life metaphor of this for me was watching a “broken” horse find his spirit again in the training theatre of Canadian natural horsemanship trainer, Chris Irwin. The beautiful quarter horse palomino was docile and well-mannered. Ground tie him, i.e. attach a rope to his halter and just let it drop to the ground, and he’d stand there quietly, unmoving and disinterested in the world around him, just waiting for whatever was to happen next. He’d been so well “broken” that the light in his eyes had all but disappeared. The equine equivalent of a human zombie, I’d say. His owners, who’d recently purchased him and were concerned about his malaise, had brought him to the training session to see if the light could be restored to those big brown eyes. They wanted to give the poor animal a chance to feel like a horse again. Witnessing the transformation in this horse over the three-day session was awe inspiring. Through measured and controlled groundwork and round-pen exercises Chris, and those of us who had an opportunity to work with the horse under his supervision, was able to help awaken the horse to a more authentic way of being. 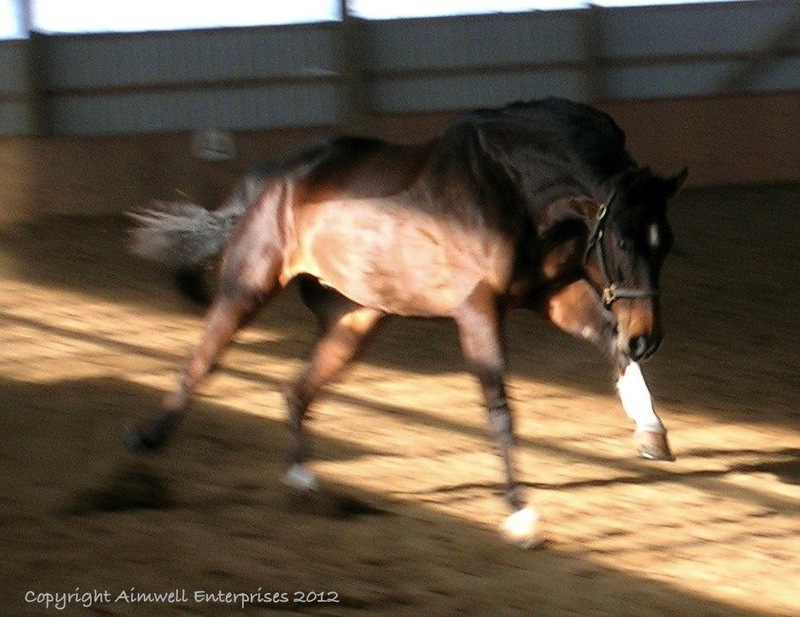 It was one of the most miraculous things I witnessed while training with this great horseman. The journey to awareness for that horse was not easy, however. Even under these protective and nurturing circumstances the horse was confused and acted out. The notion of “awakening” was a scary prospect. However, by the end of the three-day experience obvious gains had been made. The horse was more animated and more engaged with the world around him. The interesting thing for me was that as I observed the transformation in this beautiful golden horse I recognized the need for such a change in my own life. It’s when I began to realize the depth of my own broken spirit. It was another sign it was time for me to seek help and step into my own light. Changing is never easy. It’s why most people choose to avoid it. But I believe that every time we resist the opportunity to heal and expand our lives in some way we entrap ourselves, and those with whom we interact on a daily basis, in an endless cycle of misery. Waking up is hard to do, but it must be done if we are to realize, like the beautiful palomino, a chance to see ourselves, and the world, from the vantage point of our truth. This week I unearthed an old project as I was cleaning out Bear’s file. A few years ago I had a little fun with his official passport picture and created my take on the ultimate all-terrain vehicle. Sadly, the original image is not on this computer so I was reduced to photographing the printed copy with my iPhone and uploading it. The image is a bit fuzzy, but I hope you can get the gist of it. If you click on the image and enlarge it helps. This leads me to share how Bear’s all-terrain capacity was put to the test earlier this week when we went hacking for the first time this year. After a grim winter riding in circles in the indoor arena it was, I hoped, to be a gentle awakening to a new experience. I wasn’t sure what to expect. I’ve done plenty of hacking in my life but not much in recent years, and together Bear and I have certainly never done anything like this. We accompanied a small group into the rolling back fields where a course of cross-country jumps resides. Before embarking on our new adventure, however, we worked in the arena for about 40 minutes to take the edge off. I felt confident enough and figured if not now, when? Sooner or later Bear and I were going to need to expand our comfort zone. So, in single file with Bear the last in line, we headed downhill along a tree-lined lane way which passes by the old bank barn. In the summer months this is a really pretty spot of dappled sunlight. Right now, however, the lane is a mess of mud and melting snowy slush punctuated with tangled, fallen timber, remnants of December’s horrible ice storm. Bear was a brave boy as he baby-stepped his way down the unfamiliar hill. And, while he was attentive to me I hoped he would also feed off the confidence of the three horses ahead of us. The lane to the pond lies to the left of the bank barn. A snow bank blocks the way. Jerome is in the paddock. This image taken in January. At the bottom of the hill and to the right of the path we passed a pond which is presently still frozen, and to the left an abandoned paddock awaiting its rebirth as a turnout space for retirees. The paddock fence ends at a river bank that cradles a small stream which, at present, is swollen with spring run-off. This was all new to Bear. By his timid steps I could tell he was bravely facing his confusion. He wasn’t necessarily upset, but like anyone facing the unfamiliar, he was proceeding (as was I) with caution. Then came a small wooden foot bridge that crosses the stream. Bless him, Bear was not so sure about this. The other horses were already on the other side of it when we arrived. The combination of the snaking stream’s hissing, bubbling waters and the sound of hollow footfall over the wooden bridge was almost too much for my darling boy’s warmblood mind. He fretted, backing up and moving sideways, unable to compute the gentle aids I was using to ask him to keep moving forward. There was no point in getting angry or frustrated with him. I wanted this to be a good experience so he’d be happy to come here again. The barn manager called instruction from across the bridge but recognizing our predicament was only getting more stressful, she rode to our rescue so we could follow her over. Almost immediately Bear began to relax and was happy to bump hips with her horse across the bridge, snorting a sigh of relief when we reached the other side. As we climbed the still snow-covered hill that led up from the stream, I was feeling somewhat intimidated by the soggy terrain. However, I reminded myself that Bear is designed to handle these conditions. All I really needed to do was put him in gear and stay out of his way so he could do what comes naturally … move. We lagged behind our companions for most of the hack, but every so often someone would turn to see how we were doing and reassure with a smile. Up and down small undulating hills we went and, at one point, into a little gully where water had pooled fetlock deep. Bear, whose all-season radials prefer drier conditions, put on a brave face and waded boldly through, even while his buddy, Dream, stopped in the middle and pawed and splashed like a happy child in a bath tub. Then, onward we went, past large, fixed obstacles, through the snow, slush, mud, and more big puddles. Bear was alert; curious, but he wasn’t afraid. He simply attuned to me and followed the others while quietly absorbing his surroundings. Sure, he hesitated a few times while attempting to navigate around puddles and the the deeper snow, but I do believe that overall he rather enjoyed himself. He offered no indication that he was experiencing any undue stress. He was, it seemed to me, happy for the change of pace and scenery. 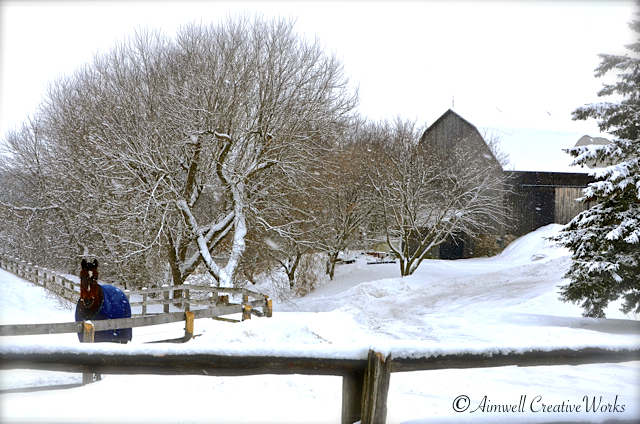 Soon it was time to turn around and head back to the barn. The hack was only meant to be a taste of what’s awaiting us as the season unfolds. Right now much of the property is still too snow- and ice-bound for exploration anyway. As we approached the bridge from the opposite direction I wasn’t quite sure what to expect from Bear, but being the bright boy he is he took it in stride and happily followed the other horses over the swollen stream and ice-covered pond, up the steep, slushy hill and back to the comfort of the barn. It was a proud moment for me. Bear stepped up to this new experience beautifully. Waking up, and expanding our comfort zone, is hard to do. Still, when we land in an environment that promotes growth and surround ourselves with people who care a whole new world can open up for us. An expansion of mind, body and spirit takes place that leaves us feeling stronger, more confident and prepared to take those next defining steps in our lives. This experience was a lovely, gentle wake up call for both Bear and I.
I love those the best. Today Musings of a Horse Mom is a proud recipient of The Versatile Blogger Award, courtesy of a nomination by Shakespeare’s new friend, Gypsy, at Hooves and Claws. 3) I first started riding horses 40 years ago at Frith Manor Stables in North London, England. For four years or so it was my favourite place in the whole world. 4) I’m a bit obsessive about colour coordinating Bear’s exercise bandages (polos) and my outfit. It just feels better to be well turned out. 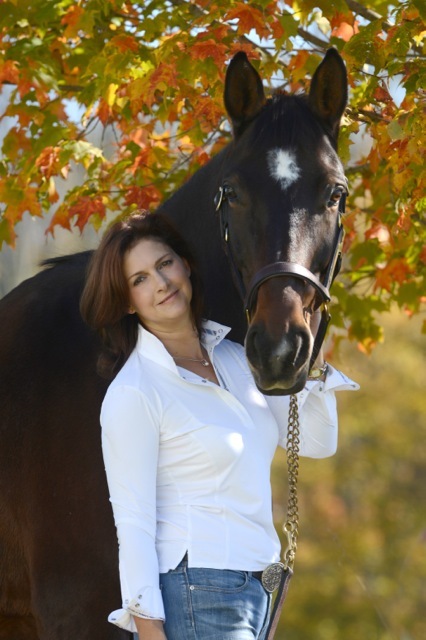 7) In 2008 I received a People Make A Difference Award from the Ontario Equestrian Federation for my volunteer efforts as President on behalf of Toronto CADORA, Canada’s longest-running dressage organization founded by eight-time Olympian, Christilot Boylen. 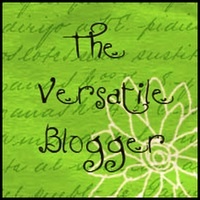 Now the fun part … blogs I nominate for The Versatile Blogger Award. I hope when you have a moment you’ll take an opportunity to pay them a visit. These blogs have moved and inspired me each in their own way, and while I’m not always able to visit on a regular basis to show my appreciation for their creative expression, passion and versatility, by this nomination I salute them. A special shout out to J.G. 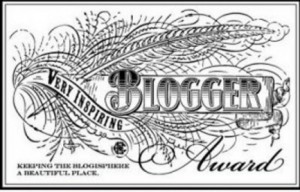 Burdette who nominated my blog, Eyes to Heart for The Versatile Blogger Award in spring 2012. I don’t know if there’s a statute of limitations re: acceptance of these awards, but I hope to follow up on that one soon. My thanks to everyone who responded. Over the next few posts I’ll endeavour to address each of the statements mentioned in the poll. Fifty per cent of respondents indicated that horses are as necessary to their lives as the air they breathe. Evidently I am not the only one under the spell of Equus. The air I breathe is infused with the essence of horse. It has been since I was a little girl. 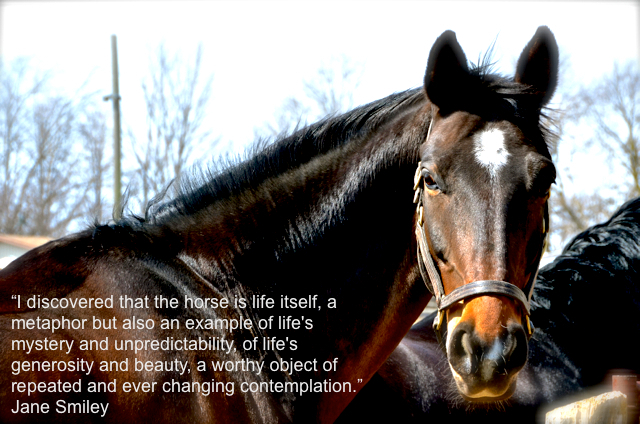 For a while, only God knew why, but as the years have unfolded the reason has become increasingly clear … the horse is one of my most important life teachers. As with many horse people I was not raised on a farm. I was city-born with a country heart and, as I’ve described in my bio, horses have coloured nearly every aspect of my life. I might add that they’ve saved me from myself more than once and been therapy when I had no idea what the word meant or even how it might apply to me. When I was in my late 20s/early 30s I stopped breathing “horse.” For reasons I won’t get into here I surmised that horses were a childish pursuit and it was time to “grow up.” So I stopped my weekly visits to the barn, stored my equipment and commenced a more adult pastime — wandering in a desert called Misery. Only I wasn’t aware of this at the time. It wasn’t until after four years of this nonsense and a death in the family that I recognized the alarm bells that had been ringing in my head and the heaviness in my heart. I recall the moment distinctly. I was sitting, one gorgeous summer’s day, in the grandstand at the Calgary Stampede with my brother and (now ex) husband. It was a week after the funeral. My gaze wandered enviously about the competition ring where cowgirls on beautiful sorrel quarter horses and thoroughbreds were parading. The horses’ coats glistened in the sun and I found myself catching my breath. It was a surreal moment — the metaphorical chains around my heart loosened their constrictive grip and unleashed a flood of emotion (no doubt fuelled by my grandmother’s death the previous week). Tears streamed freely down my cheeks as I realized, in that moment, that more than anything else in the world I wanted, needed, a life with horses again. My brother looked at me and smiled — he understood. My husband was bemused. In my heart I knew this was the perfect opportunity to turn a bad situation into something better. Somehow I knew that allowing myself to breathe horse again would change me. And I felt that by doing this I could honour my grandmother’s memory too. She’d want me to be happy. I didn’t want her death to have been in vain. Within six months, and much to my husband’s chagrin, I’d quit my corporate gig and signed on with a local equestrian centre to do an internship working toward my national coaching certification. I was fulfilling a life-long dream to work with horses. Suffice to say horses have been an important catalyst for personal growth on many levels. With this in mind, it’s interesting to note that in recent years there has been a growing trend toward equine-assisted therapies — the Canadian Association for the Riding Disabled (CARD) being an example — and equine-assisted psychotherapy. Linda Kohanov and Chris Irwin, among others, are pioneers in this area. I know many people who have been touched by the spirit of Equus who could speak to its positive effect in their own lives. So, far from being just a pastime and passion, Bear earns his keep in more ways than the mind can imagine or the heart can fathom. 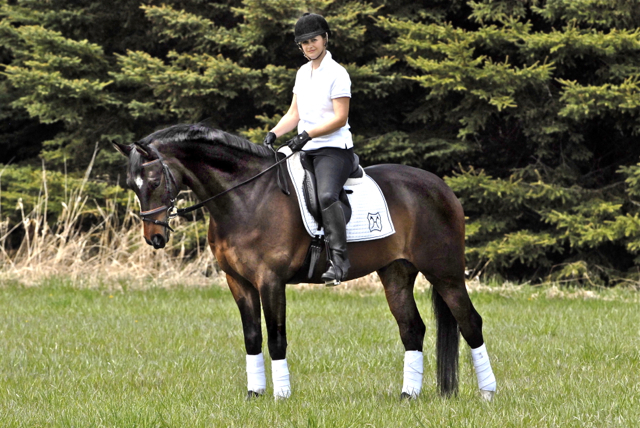 Caring for and riding him is a fun, albeit intense, physical and mental activity, but it’s more than that — it’s a metaphor for living. I believe we create our Heaven (or Hell) here on Earth based on our choices. While I would like to say I have chosen to be a steward of the horse I feel the truer statement is horses chose me. When I gave them up all those years ago I’d broken a sacred connection. Imagine if I hadn’t come to my senses that summer day in Calgary? I wouldn’t be on my healing path and I wouldn’t have Bear. So, if Heaven on Earth is here with my horse, than indeed, God forbid that the Heavens above should exist without the spirit of the horse that cast its healing spell on me so long ago. As necessary to my life as the air I breathe? … You better believe it! Triggers … What sets you off? This week I’ve been musing about triggers, mostly because I’ve been acutely aware of my own. And I don’t mean the Roy Rogers kind of trigger (horse or gun). No, I’m talking about the kind we all experience in our own way — the ones that jump start an unpleasant and uncontrollable reaction to an outside stimuli … that is until we have become aware of, understood, and come to terms with the trigger’s origins. On this intense journey of self-awareness I’ve been travelling the past while I’ve bumped up against many of my triggers. While this hasn’t necessarily been a pleasant experience it has, nevertheless, afforded an opportunity to get to the bottom of some negative behavioural patterns in my life. It has also allowed me an opportunity to learn how to recognize the triggers and pre-empt them to promote a more positive way of being. My saving grace through all of this learning has been my loving partner, Lloyd, and an amazing support team (psychotherapist, hormone therapist, massage therapist, chiropractor, naturopath, riding coach, music coach, and last, but certainly not least, equine therapist). When I resolved, 12 years ago, to divest myself of a lifetime of unwanted emotional baggage little did I know just what that meant and how much help I would need. Through it all I’ve been learning to step into a new way of being — an intense and exhausting exercise that’s well worth the price. This year has offered a stark lesson on cause and effect, stemming from looking in the eye a life time lived with undiagnosed PTSD (Post-Traumatic Stress Disorder). Pushing through life in survival mode finally came to stop when mid-life hormone changes offered a sharp reality check. One day just over two years ago, while riding Bear, I was struck with explicable and unnerving fluttering sensations in my chest and throat. Near panic attacks while astride a 1,200 lb bundle of nervous energy is a dangerous, and debilitating, thing. Something had to be done or I was heading for a serious fall, in more ways than one. Thankfully before this revelation I had learned to pay attention to wake-up calls which, to my way of thinking at least, are simply giant triggers signalling a time for major personal change. Horses are wonderful teachers when it comes to learning about, and understanding, triggers. 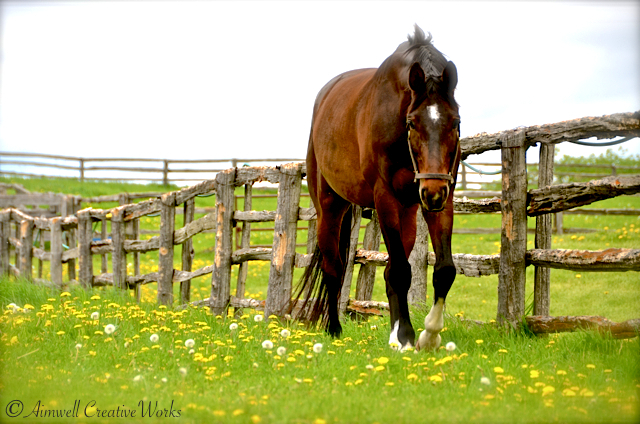 Since horses are, as respected Canadian natural horsemanship trainer Chris Irwin notes, “victims waiting to happen,” they are easily triggered by unexpected exterior stimuli. For instance, when Bear was younger the sight of a white plastic bag flapping in the breeze would be enough to send him into orbit. If I was riding him at the time the offending object came into view I was treated, at best, to a spooky side pass as he gave it the hairy eyeball. At worst, an irrational bolt at warp speed across the arena or an almighty buck would trigger my own panic button and might land me in the dirt. Unless you’re a rodeo rider or have a death wish this type of in-the-saddle experience is usually not recommended and best avoided. Bear’s brain farts have taught me, however, to be vigilant when it comes to recognizing what is, in his mind, imminent “danger.” This way I can pre-empt his need to have such an explosive reaction in the first place. In effect, my powers of observation must become even greater than his own. I must remain at least one step ahead at all times and recognize “danger” before he does. I must perceive like a horse and respond as an aware human being. Distracting him from whatever might offend is as easy as directing his mind and body into a different movement or exercise that keeps him in the moment with me. Doing this gives him a reason to trust I will keep him from harm’s way which, besides a constant supply of food and a safe place to sleep, is all a horse really wants anyway. Horses will do pretty much anything for people they trust. But he needs help to learn a new way of being around flapping white plastic objects. Left to his own devices he might terrorized by them for the rest of his life. As Bear has matured and I have been consistent in his training his mind has settled and his reactions to unexpected stimuli have become less severe. Nevertheless, as his trainer (and mom) I need to stay one step ahead at all times to ensure his happy mind and relaxed state. Which makes my own situation all the more interesting. The very state of being I have been working to instil in my horse is the state of being I’m working to instil in my self. With the help of my “trainers” I am reconditioning my own way of being and to do this I must address my triggers. I’m learning to understand what is to me now a very obvious mind/body/emotion connection. Lately my reactions to certain people and situations have been incredibly visceral to the point, at times, of feeling totally and inexplicably overwhelmed such that my body shuts down and all I can do is rest and recover. It has been my challenge, again with help, to understand the origin of what triggers these unpleasant reactions and then find a constructive way to manage them. What I’ve learned is that if we don’t take the time and make the effort to understand why we react irrationally to certain stimuli, this stimuli will continue to trigger reactions and manipulate us for the rest of our lives. From my experience these emotional/mental outbursts produce their own debilitating physical symptoms that further torment, and it just becomes a vicious cycle until we stand up and take action to change. I would like to suggest that if we all asked this question honestly of ourselves, sought the help we needed to answer it and changed our lives accordingly, we could possibly live more harmoniously and the peace for which we are all seeking might be found. Sadly, fear of the unknown will prevent most people from stepping into the dark abyss of the soul to seek the source of their angst. For me, not stepping in was a guarantee of a life lived in continuous fear. And that, dear reader, is no life for me. This subject is open to debate. Please feel free to comment. Nurture what you love … that includes you! Horses and ice don’t mix. An icy paddock means no self-exercise for my four-hooved child sporting steel shoes on a slippery surface. He may as well be ice skating which, frankly, I don’t even want to think about. And ice plunging in thunderous chunks from the roof of the indoor arena while my baby is struggling to hold himself together? Well, the sky may as well be falling. Yesterday I arrived at the barn ready to ride. I was feeling good following a weekend of low energy and exhaustion. Adrenal fatigue has, in the short term, severely cramped my active life style and I live day to day, making very few plans and getting lots of rest. Because I felt well yesterday and it was so beautiful and sunny after a weekend of snow and below zero, I was looking forward to spending some time in the saddle. And I knew there was no way to work around it. Bear had heard the crashing too. His ears pricked earnestly toward the arena door; his eyes bulging like painted brown ping pong balls and his nostrils fluttering with worry told me his focus was not on me and wouldn’t be until this stress had been addressed. Just like that my plan to ride was shattered much like the ice crashing from the roof under the mid-day sun. I removed Bear’s tack, left it on the saddle tree and lead Bear, all on his toes and worried, into the arena. I could see by his expression that the only way to get by the fear was to go through it, so I unhooked the lead shank from his halter and let him rip. Bear tore around that 200ft x 70ft arena like he was being chased by the devil himself. Letting him loose and watching him shake his demons is awe-inspiring. Sometimes my heart feels like it’s jumping and skipping in time with his arhythmic shenanigans as he bucks and snorts and reels and chases around me sometimes at such a velocity I almost can’t watch. And when the ice clunks down along the outside of the walls and crashes to the ground you’d think, given his leaping over-reaction, that the sky was indeed falling. Canadian horse trainer, Chris Irwin, with whom I worked for a while, says horses, because of their prey nature, are “victims waiting to happen.” This is evident to me every time I see, and feel, my horse spook at nothing. It’s almost as if he’s looking for something to worry about. So imagine his animation when he supposes there is something (a chunk of ice) crouching in the shadows waiting to pounce upon him. I’ve learned to let Bear get things out of his system in his own way and time. It took about 10 minutes for him to come to terms with his ice demons. He finally stopped about 20 feet away from me, puffing and blowing out what remained of his anxiety, and lowered his head to signal he was done having a hissy fit. But I wasn’t so sure, and since we had the time I decided to test his new head space. I walked to him and gave him a pat on the neck. His sides were heaving from his exertion but his eye was soft, telling me he was feeling just fine. I turned and he followed me, of his own free will, to the centre of the arena where we stopped. I rewarded him with a sugar cube and then walked another five feet in front before turning to face him again. Bear was relaxed, his head low, floppy ears twitching to the sound of my voice. My “victim” had become a quiet, confident horse. We stood quietly for a while. Whenever his gaze wandered I brought him back to me simply by shifting, ever-so slightly, my body language. When he took a step toward me, I asked him to step back. This continued for about 10 minutes until he paid me the ultimate compliment — a great, big, fat yawn. This didn’t mean he was bored. Far from it. In fact, he was totally relaxed and engaged in my presence, which is as it should be. Then the test for which I’d been waiting. “Crash … bang … rumble, rumble … crash … ker-plunk … boom! Directly behind him outside and as loud as any of the others we’d witnessed a sheet of ice crashed from the roof. And Bear did … nothing. Okay, he flinched, a little, but his attention remained on me; he didn’t move. He trusted me enough to stay connected to me during an episode which 20 minutes earlier would have sent him reeling. And I didn’t have to do anything but be there with him. He figured it out all on his own and I had the pleasure of participating in his process. This is one of my favourite things about being with Bear — together we work through our individual and collective demons, building trust on the ground and in the saddle. I probably could have ridden Bear after that, but decided not to bother. We’d already succeeded and were feeling good about it. Instead we went back to his stall where he was fussed over and spoiled with carrots … the perfect way to end our visit. Today is overcast so with any luck the ice, whatever’s left of it, will hold, the sky will not fall and Bear and I will enjoy saddle play. When I look at my horse I see myself. When I became aware of that I realized that I could change in myself what I didn’t like, but the change had to begin with me. So then my horse became my therapist. The mystery of why I am the way I am and have done things the way I’ve always done them started to unfold when Bear trotted into my life. Before his arrival almost six years ago, I thought ahead and took the positive step of enrolling in a horsemanship course with internationally-renown Canadian horse trainer, Chris Irwin (www.chrisirwin.com). Even though I had been around horses for most of my life I wanted to ensure that Bear and I got off on the right foot, and Chris’ course promised to teach me to “think horse, speak horse, and play horse games by horse rules” so I could “be the better horse” and my horse would learn to trust me. It was one of the best things I could have done for myself … and my horse. What I hoped would simply nudge me up the path to being a better horse person/trainer actually became the catalyst for taking a good look at my life in general. 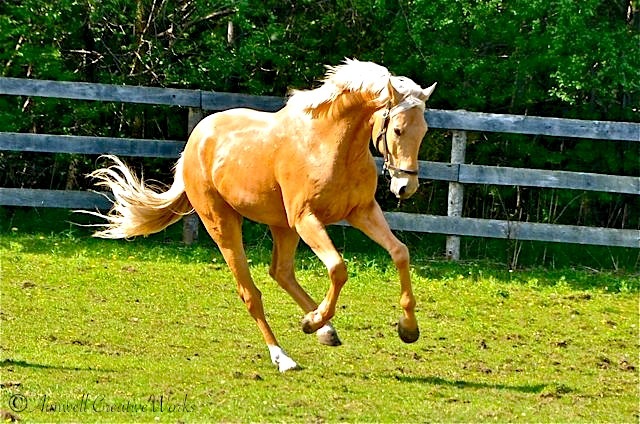 I learned that the issues I had with my horse were mere reflections of greater issues that had plagued me for years — the inability to make a connection and keep it; getting stuck in transitions; being left behind; the overall heightened anxiety of my existence (which has recently manifested physically with adrenal fatigue), and other debilitating ways of being. Sounds like I was a mess … and I was. I learned that when I over-reacted, he over-reacted. When I wasn’t paying attention, he wasn’t paying attention. When I was stuck, he was stuck. 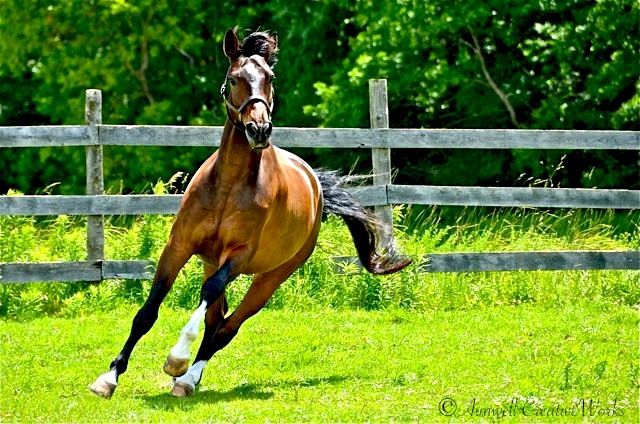 Horses live in the moment; they get their cues from us by reading our body language. I had no idea how fractured my life was until Bear — through his own hairy fits, spooks and other prey behaviour — made me sit up and take notice. Ultimately I knew that if I didn’t do something to bring my life into focus I would never be able to get Bear to focus on me and one, or both, of us would end up getting hurt. So, my equine therapist sent me to therapy. What I’ve been working on these past several years, incorporating the horse training techniques I learned from Chris and the knowledge of other caring professionals, is due to Bear’s call-to-action. Perhaps the most important thing I’ve learned is that self-awareness is the key when desiring an authentic relationship with yourself and anyone else, never mind a horse. The personal work I’ve done during the past several years has manifested an amazing, trusting relationship with my beautiful horse. Every time I look at him I see and feel the progress we have made together. We are better connected; our transitions are smoother; we are moving out of that stuck place and our confidence is increased. When I look in the mirror that is my horse, I see love.